The Rio Petrohué is the only river to originate in Lake Todos Los Santos. 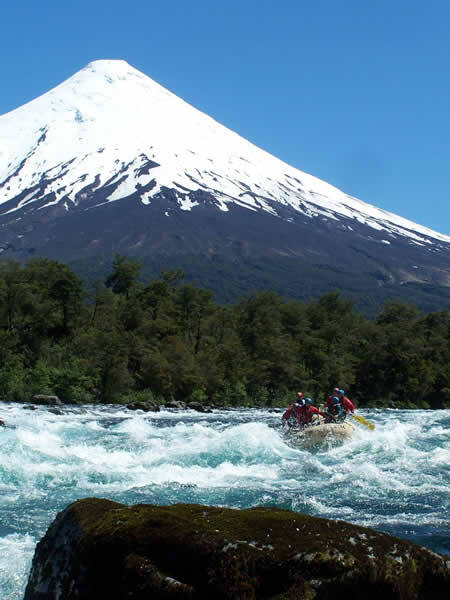 Its turquoise waters that flow along the base of the Osorno and Calbuco volcanoes, and its class 3 and 4 rapids are ideal for safe yet exciting rafting in this exquisitely beautiful landscape. Before setting off, you receive a brief introduction into rafting techniques, as well as handed your equipment, which includes a wetsuit, windbreaker, life jacket, helmet and paddle. Then the wild journey downriver begins, and can be rounded off by a swim in the crystal clear waters of the Rio Petrohué. We recommend to bring swimwear. Previous experience is not necessary. Rafting guides and a safety boat are included in every tour. Rafting rio Petrohue from Sascha Roth on Vimeo.